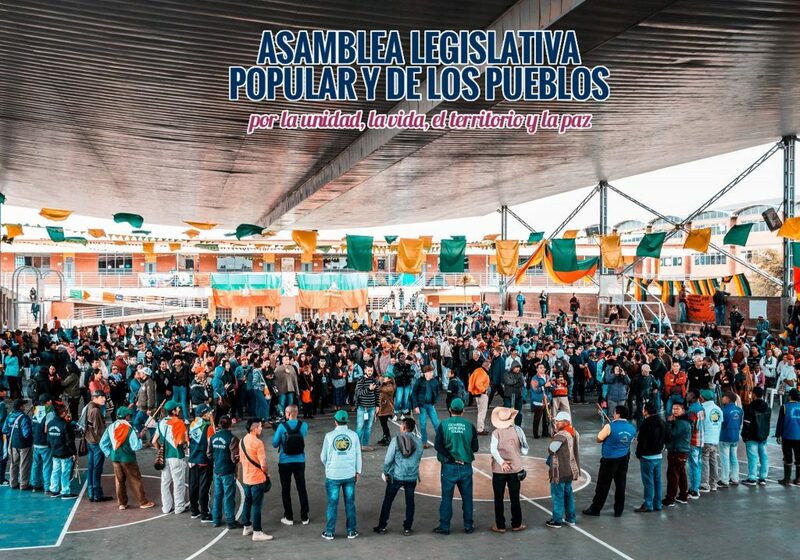 On October 9, 2018, more than 1,500 people gathered at the Claretiano School in Bosa, in the south of Bogota, Colombia, to begin the Popular and People’s Legislative Assembly. This assembly is a space that seeks to build a proposal of unity of Colombian social movements, an agenda of mobilization against the policies of current government and a Popular Mandate that synthesizes the claims of territorial struggles. This event will culminate tomorrow on October 12. The event began with a mobilization of the indigenous, Cimarron community and peasant guardia. “Fuerza, fuerza” [strength, strength] chanted the men and women who will guarantee security and good development of this event. A harmonization ritual was also carried out by the Muisca indigenous people, the ancestral owners of the Bakatá territory (where Bogotá is located), and they were later joined by the Wayuu indigenous community. Other acts of mística also took place like playing the conch which made reference to the four elements: earth, water, fire and wind while people from all the regions of the country exhibited their food in the form of a mandala. During this event, social organizations will contemplate on the challenges of different people’s sectors, will discuss the dynamics of the extractive industry that threaten life in the territories, the peace building initiatives and will seek to build a joint agenda of mobilization that responds to the needs of communities in their territories. The participation in the upcoming elections will also be taken into account. A wide range of social, human rights, women, indigenous, Afro-descendants, students and urban movements, organizations and platforms from Colombia are participating in the assembly, (to see the names of some of the organizations that are participating see below). The Colombian organizations and activists are joined by internationalists from peoples’ movements of different countries such as Mexico, Brazil, Ecuador, Venezuela, Spain, Germany, Palestine, Guatemala, among others. Jimmy Moreno, a national spokesperson of Congreso de los Pueblos, the People’s Congress which is one of the central promoters of the Assembly, commented on other objectives. Apart from the mentioned issues, the meeting will also address the state of implementation of the Peace Accords signed in Havana, the current government’s process with the National Liberation Army (ELN) and the worrying situation concerning the assassinations of social leaders across the country. Participants have also made sure to highlight that over 430 social leaders have been assassinated in last 32 months, mainly by paramilitary forces that operate throughout the national territory. In addition, President Ivan Duque, pulled out of talks with the ELN even after they released 6 people in their captivity and agreed to negotiate the cessation of military activities as conditioned by the government to evaluate the course of peace negotiations and its continuation. The country will witness a number of social mobilizations this week. While on Wednesday, October 10, students’ movements took to the street in the grand march in defense of public education. This Friday, October 12, several demonstrations at local, regional and national levels are expected to be carried out by the social organizations involved in this event. The organizations participating include: National Agricultural Coordinator (CNA), the National Indigenous Organization of Colombia (ONIC), the Congreso de los Pueblos [People’s Congress], the Process of Black Communities (PCN), the Agricultural, Peasants, Ethnic and Popular Summit, the Redepaz, the Central Union of Workers (CUT), the Juntanza de Mujeres [Women Assembly], the Ciudades en Movimiento [Cities on the move], the National Association of Peasant Reserve Zones (ANZORC), the Association of Cabildos Indigenous of North Cauca (ACIN), international movements, and representatives of political movements such as the Common Alternative Revolutionary Force (FARC), Colombia Humana [Human Colombia], Alternative Democratic Pole, Marcha Patriótica [Patriotic March] and Coordinadora Socialista [Socialist Coordinator] have come together to build a common agenda to converge struggles of various sectors and settle the differences that fragment Colombian social movements.